It came as a longing for cheap food, the kind you find in Saudi Arabia in every corner. Foul. Tamees, Shawerma. Roz Bukhari. It’s oddly uncommon here in the UAE. But then maybe that is due to the fact that Dubai is levels more organized than, say, Jeddah. City life, run by frigid corporate systems, has been getting to me. I was starting to feel desensitized and isolated in a shell of routine and pretenses. I wanted to come alive again even if only for a few hours. Eating out in Dubai, I am often presented with dazzling options. But I needed more. Perhaps the better word is less. So I sent a shoutout to my friends on Facebook. Who knows where I can find cheap food places in Dubai? By cheap I did not mean 30 dhs cheap, or even 20 dhs cheap. By cheap I meant developing country cheap where you not only sample the flavor of the food but also the flavor of the person who made it. Osama responded to me right away. A Saudi entrepreneur who lives in Dubai and a friend of mine. Satwa, he said. In a big dazzle ‘em city, it’s the part that reminds me of Jeddah the most. So off we went in search of the drippiest, greasiest food the price of birdseed. Cheap food we did find and so much of it. But what we did not except to find were two things that we could not acquire when eating out in Dubai: simplicity and pure childlike fun. It promised tea under a blue metal canopy surrounded by a hedge. It was a an inviting enclosure that, in the dying of the daylight, glowed in all of its green-tinged fluorescent glory. It was hot and humid and absolutely perfect for Indian food. We sat on hard metal chairs and laughed our hearts out it was simple and silly. All the cosmopolitan pretenses fell apart to let our inner Jeddawi children through. This was all very familiar…Indian food came at last along with sweet lassi and not a drop of tea. The conversation came faster: The meaning of life. The masks we put on in our lives in Saudi Arabia. Spiritual ascension. The real meaning of depression. Intuition…and all those gorgeous topics. The waiter, we tried to engage but he very little English and was as shy as a moth so we left him alone. He was not a part of our quest this evening. But I knew someone would be. Second: The hardware store. The two Indian men must have thought I was a loon because of the way I was cooing at how the PVC pipes were stacked. To them, the pipes were simply items to be used in menial jobs. I saw lines and shapes, art tumbling around the store. For some reason I’ve always been fascinated by hardware stores. Never used anything, mind you, but tools present to me possibilities of all the things you could do. And nothing is more seductive than that. This store was not the only spot where I could see lines and shapes. I saw lines and shapes everywhere, in the light breaking the shadows and in the people in their small moments and almost imperceptible expressions that gave away everything about them. In Satwa, in contrast with the rest of Dubai, life was revelational and revealing. Osama and I felt it in ourselves. No pretenses. More wonder. A sort of melding with the weather so that we ourselves became the humid breath of the world. Third: We found our guy. The character of the evening. 3ammo Al Irani, I called him. You know how you can get into a deep conversation with a stranger and then realize hours after you’ve parted that you never asked them their name? Osama and I walked into an apothecary, quite by mistake. My impression, by the straw hats hung outside the door was that it was a handwoven goods store. As soon as you walk in, however, you are overpowered by all those spices and perfumes that, when stored up together for too long begin to weave a thick magic of their own. Some of the ingredients were used for magic too. The Iranian man told me that Morroccan ladies often come to him to buy raw pearls in a jar to cast love spells with. The guy must have been in his sixties or above. As sweet and shrewd as Saffron. We talked with him about the ingredients in his store, his life of forty years in Dubai, the Arab world. He spoke to us with an acquired Arabic that often tripped and fell and quite endearingly. Finally, I got to ask him the question I’ve been meaning to ask someone in Satwa who had something of meaning to offer. I was humbled. Could I ever come to this conclusion myself in my own path? Or something similarly bare and stripped of excess? “Yes! Yes it is!” he said, laughing. There are pockets of genuine experiences in Dubai, opposite to what I thought. Ever since I moved here, I felt the pretenses that people wore, like chain mail but transparent. They were different from the pretenses that people in Saudi wore. In Saudi, it was often fear and shame that caused people to wear masks to hide who they were and what they thought. While here, in Dubai, my hunch was that what drove these pretenses was survival, fear of failure, ambition, competitiveness and the constant race with time. I can feel myself wearing these pretenses as I head off to work in that big glass building that I am currently bound to. I become hard and efficient and mindful of all my mistakes - because there can’t be any! 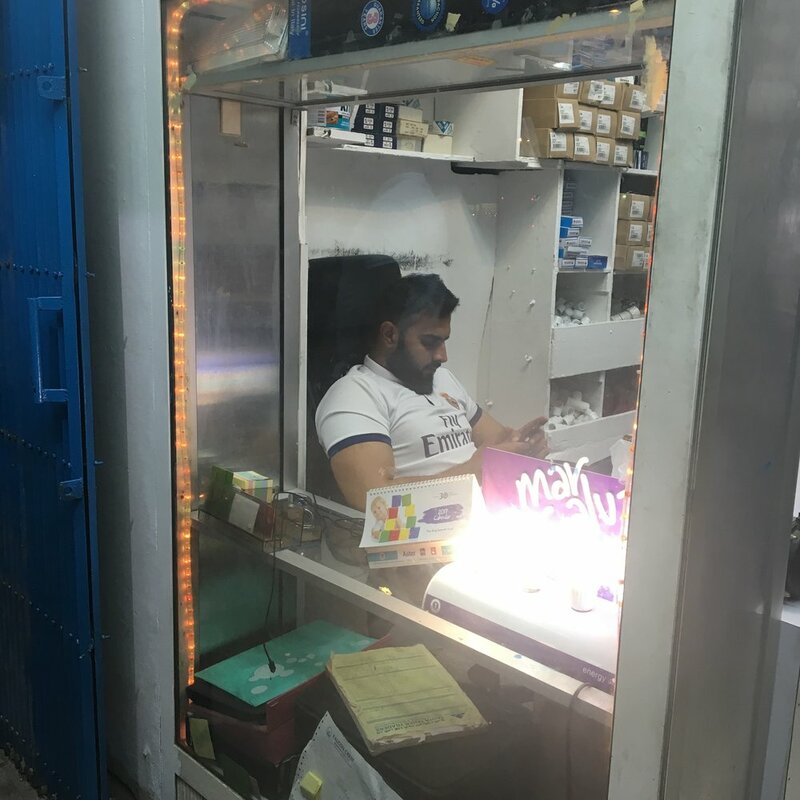 In Satwa, where money is not the friend or the enemy, and only health is happiness - as the Iranian man would put it - I stopped feeling like a machine and the juices of the human fruit that I was, spilled out. I miss this, I thought to myself. The corporate world teaches us to count our fun by the minute, by the day and put it all in the system. You watch the clock. You time your meals. You have two days at the end of the week to begin to find yourself again and by the time you’ve found yourself, it’s the first day of the week all over again. So where am I going with all this….? It’s a question I ask myself everyday. But I do know, that I was want more evenings like this in places like this, Satwa style, where you peel yourself and operate in the world in complete abandon. So next time when you think of eating out in Dubai, how about you drop the glam for an hour or two? You might find yourself. So my move to Dubai started with boy trouble. It was not boy trouble of the commonplace kind. It was the kind that slashes through you, through the flesh and the rib cage and the deepest chambers of the heart so that the Divine light that was trapped inside there could splay out in crystal wonder. The first couple of days at my new [corporate] job (we’ll get to that later), I was too devastated to focus. My heart was having contractions. My stomach was wailing. My blood coursed hot, urging the rest of me to be warned about the demonic child that was about to be born. This child was going to eat me up, I was sure. If any of you are good friends with anxiety-ranging-on-panic, you will know what I’m talking about. In the afternoon, I walked around the city, apartment hunting, but not really seeing anything. Just a mess of walls, doors, counter tops that didn’t really register as walls, doors, and counter tops. A broken heart can do that to you. Then I locked myself in the bathroom in my hotel and crouched down in the shower sobbing and the ceramic echoes sobbed back at me. Why was everything taken from me? Ripped away? For a new beginning? A beginning of what exactly? It accumulated to a pinnacle of pain and I prayed really hard, with my head on the floor, begging for help with this difficult thing they call surrender. I didn’t know how to do it just then. Until the answer came as: give it to me. That thing you’re holding onto. That thing you’re terrified of. Let me do it to you so you can see…so you can feel for yourself…I am behind it all. At last I surrendered. I was read to give it away. I had no choice. The pain pushed it out of me. Hours later, I had a talk with the man I shared my heart with. It took courage. As the nausea mounted in my throat, I listened to him. We spoke for hours. I said what I needed to say and I heard what I needed to hear but regardless of the words, or the explanations, or the clarifications, or the assurances, Knowing began to hum in the background. The words stopped mattering. The meaning, gentle as it was, stopped mattering. When rightness comes it sounds like a soft bell, somewhere in the region between the gut and the heart. It was like I could see with the eyes of God. This is what surrender feels like. This is alignment. I saw the universe and its many pathways, separating, crisscrossing, re-merging, intertwining. This is the way that consciousness plays. Today was my third day at work. I now work at a major broadcasting company and the atmosphere is fun and positive but you cannot escape the fact that you are working in a corporation. You have to ask for vacation days through an online system that shows you how many days of fresh air you’re allowed. When I walked in, today, I was escorted by something larger than me into what Dr. Lissa Rankin calls "the plane of love". The plane of love is where love resides, so encompassing, bigger than all of us and does not belong to one person, does not come from one person, and cannot be given to only one person. When the day was done, I walked out into the late afternoon sunshine and crossed through some greens. In the plane of love, I could hear the plants again speaking not with words but with what I can only describe as a green sense. They spoke tenderly. Gratitude. Welcome. I know. I know you suffered. You are loved. Join us in this quiet flow. I held the leaves to my chest. Speak more to me. The strange thing is, that I’m sitting quietly on my bed right now with wonderings. They circle above my head like the white doves in Makkah. I’m wondering about deservability. What have we been taught about deservability at a young age? Disasters, I’m sure. Do I deserve the love I yearn for, the love I believe in? Am I worthy of this extraordinary magic? Did I have it and lose it because I’m made of too much bone and not enough water, too rigid, too pleading, too scared…too something? Or did I Iose it because I’m not enough something? Or have I just woken up into the greater plane of love into the arms of One who was always there, waiting for me accept it? A strange unexplainable sadness lingers with me. My heart is still aching for what I've lost but I am in love...not with anyone or anything in particular. I am in the state of love. My jaws tingle and a sparkling rush travels up my face to the crown of my head, where a sacred white flower opens. This fearless pilgrim has learned to give her heart, the most precious and guarded thing, to someone and through that someone, pass it on to the Creator. Only good and true things can come of this. Perhaps magical things, even. So the journey continues. Dubai, city of walls and concrete, what have you to teach me?